I checked my Google Account the other day and did not know we have complete access to everything Google has saved about us. I was amazed that I had over 18,000 photos on Google Photos, and all stored for free! Google has a wealth of information about your relationship with them. I had no idea until I looked at my account and saw for myself. Check it out at your Google Account page. Scrolling down that page I found the Account storage section. I knew I had 15 GB with my free account and some additional room from recent purchases like my Chromebook. When I clicked Manage storage, I saw how much space was being used for different purposes. 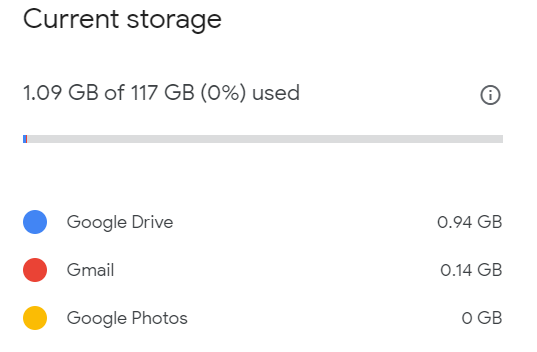 My Google Drive is using .94 GB for non-Google data. Google data, like Google Docs files, do not count. Neither do my 18,000+ photos in Google Photos. Attachments in Gmail are taking up .14 GB. Scrolling down on that page, I found that I could, for a price, increase my storage to 100 GB and up to 20 TB and include members of my family. I’m not sure that extra space even matters to me. 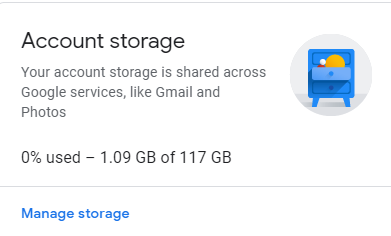 I have been using Google for years and am only using 1.09 GB of my original 15 GB allocation. As well as finding out all this information, your Google Account Dashboard will allow you to see and manage the data in your Google Account. That includes the things you do, like searches, and the things you create, like email. And you can download your data– all of it should you choose. That removes the worry of wondering what I would do if Google went out of business or lost all my stuff. Just like backing up my hard drive, I can back up my Google Cloud, too. Did you find anything interesting in your account?